1900-1907 autograph album that belonged to Florence Emily Brown of Pocahontas, Illinois, and Old Ripley, Illinois. 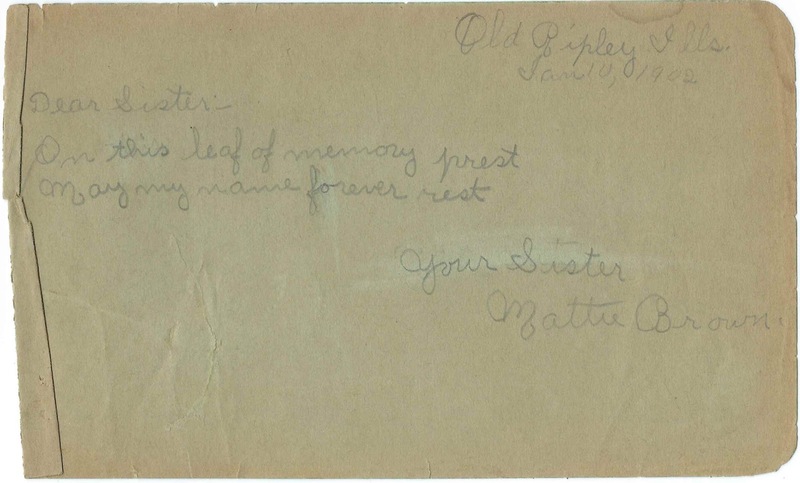 Inscribers included relatives, friends, schoolmates and teachers, all from Illinois. 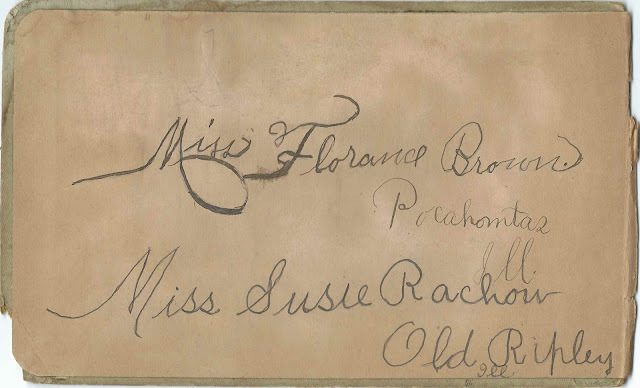 Florence wrote her name on the inside front cover, along with Susie Rachow (who also inscribed an individual page), and penned a message to her inscribers on the inside back cover. 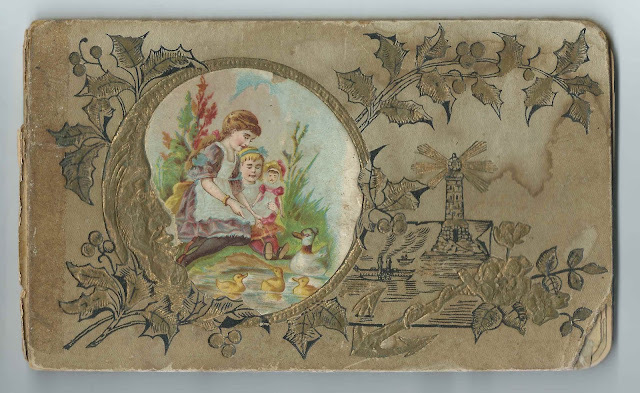 The album measures approximately 8" by 4-3/4" and contains the sentiments of 19 of Florence's relatives, friends, schoolmates and teachers. An alphabetical list of the inscribers, together with any personal information they offered, appears at the end of this post. 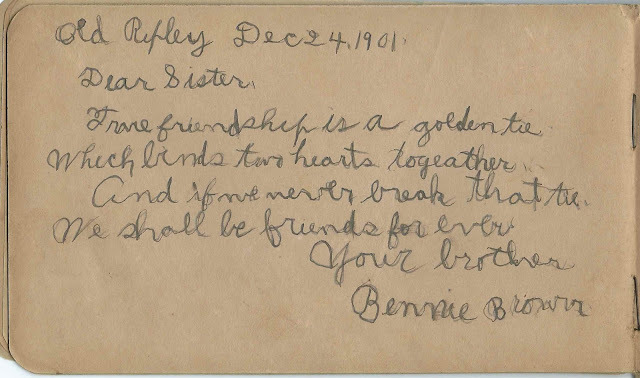 Florence Emily Brown was born in October 1889 in Illinois, the daughter of Simon Mathias Brown and Katie A. (Arnold) Brown. 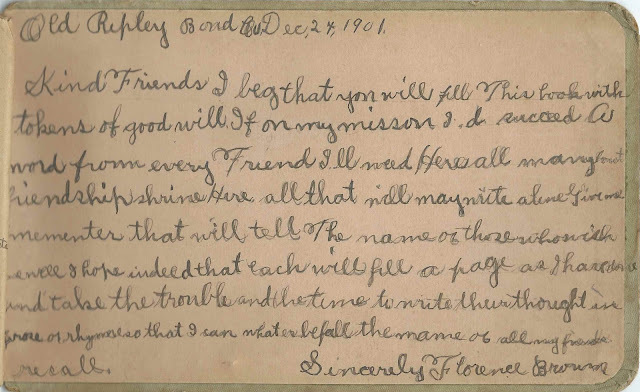 I believe Florence had ten siblings, at least five of whom inscribed pages in her album. Sister Mattie Frances Brown inscribed a page at Old Ripley, Illinois, on January 10, 1902. 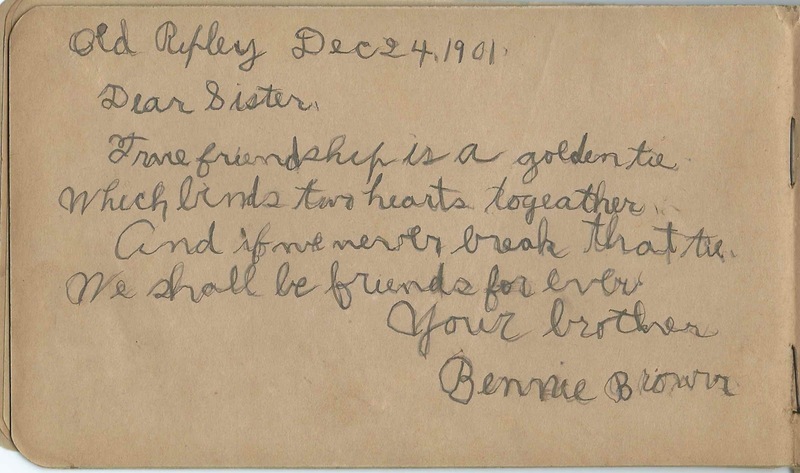 Brother Benjamin Simon Brown, "Bennie", inscribed a page at Old Ripley, Illinois, on December 24, 1901. 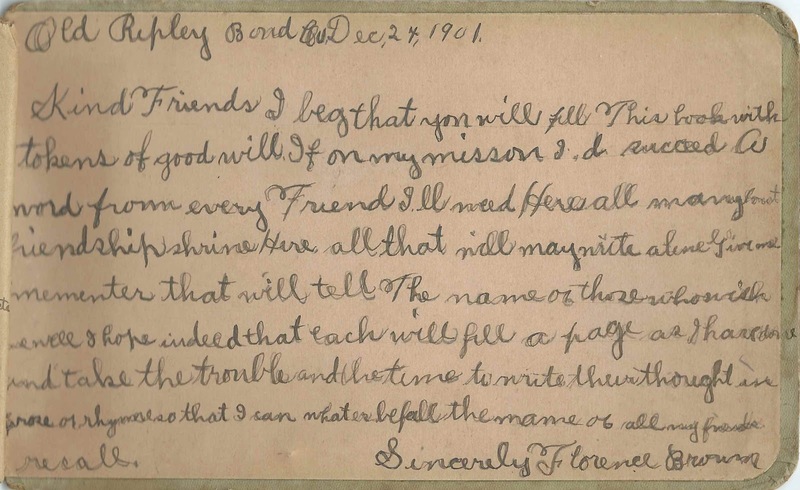 Lizzie Brown; inscribed at Old Ripley, Illinois, on May 27, 1901. Florence's sister Mary Elizabeth Brown, "Lizzie"
Florence Emily Brown was a schoolteacher before she married farmer Charles Albert Thompson sometime after 1910. They had at least two children. Charles died in 1968 and Florence in 1971; they're buried with one of their children in the Brown Cemetery at Old Ripley, Illinois. Florence Brown of Pocahontas, Illinois; she wrote her name on the inside front cover and wrote a message to her inscribers on the inside back cover. 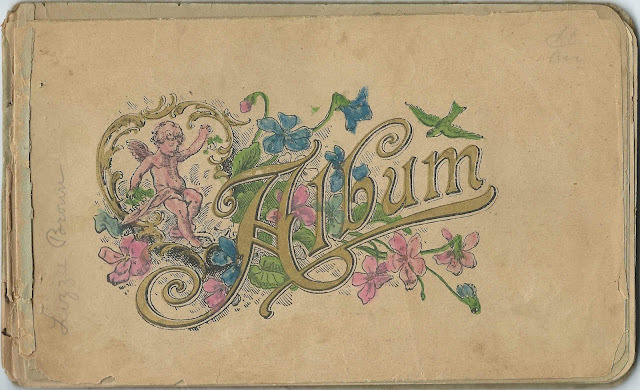 Susie Rachow also wrote her name on the inside front cover. 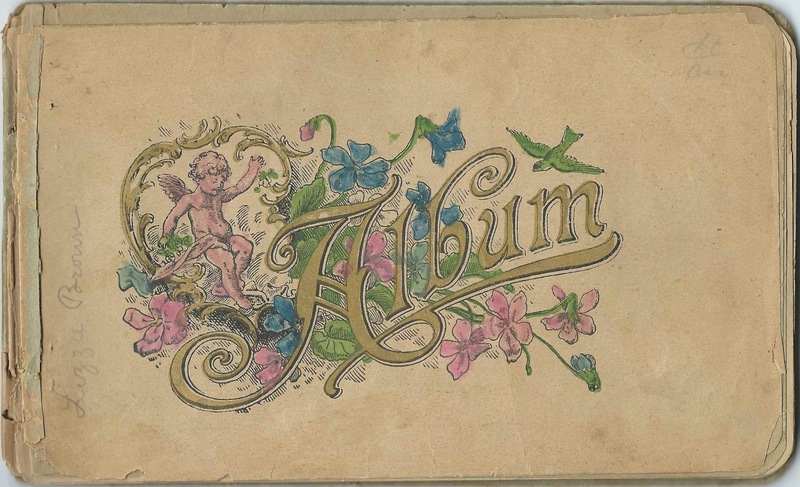 Florence Emily Brown, album owner; she penned a message to her inscribers on the inside back cover. Starry E. Delaplain; inscribed at Old Ripley, Illinois, on December 26, 1902. "Your big fat Brother"